Hi, remember me, that person who used to blog here? I am obviously having a liiiiiittle bit of a hard time balancing the many moving pieces of my life right now. I sit down most days to write a post and the next thing I know, 87 different things have to be dealt with OMG IMMEDIATELY. I keep telling myself that this is just the “season” my life is in at the moment and it won’t always be like this. But things are really good right now. Last year, I was in a real valley, emotionally. Life took a lot of effort. But now I feel happy and much more settled and secure (as settled and secure as one can be in this ridiculous world right now). Even though there’s a ton going on right now, I’m waking up excited for the day. It’s really nice to feel like that again. ~‘The Handmaid’s Tale’ Is The Most Brutal Show On TV. Why Can’t I Stop Watching? ~What Was New Girl’s Legacy? 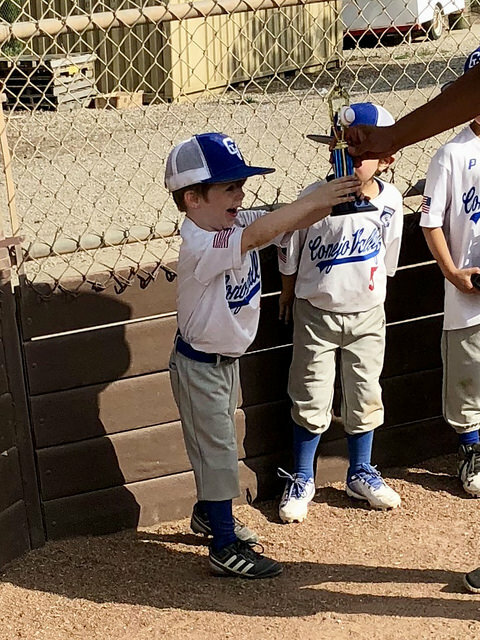 Yesterday was James’ last t-ball game of the season. For a kid with soooo much unfocused energy, I really didn’t know how he was going to do. But he LOVED it. He loved his teammates and he especially adored his coaches. And after years of watching his sister pick up trophies, he finally got some shiny hardware of his own. LOOK AT HOW HAPPY HE IS. He slept with that trophy! And that right there is why they give the littlest kids participation awards. Speaking of trophies, Annie’s All-Star team made it to the playoffs in their first tournament. Wish us luck today!!! That little boy’s face getting that trophy! I for one, am never mad at participation trophies. I tell my kids that as long as they do their best, that’s all I ask of them, and no matter what, if they indeed did their best, I will be incredibly proud of them. Not everyone is going to win – why not reward them for showing up and giving it their all? The look on his face is priceless. I am a looong time reader and have missed your daily posts but totally understand that you must do what is best for you and your family. Like always, I will continue to check daily to see if you have posted something new. Take care. That look on his face!!! Precious. That is the face of pure joy! Thanks for sharing, that made my day. First – that picture of James is incredible. Such pure joy! So heartwarming. Also.. I suppose I “get” why people are mad about participation awards, but I honestly think they’re reading into things too much. I don’t think that giving someone a ribbon or trophy when they didn’t “win” is going to create a lazy adult who doesn’t contribute to society. I mean.. come on. I am NOT a fast runner – but you bet I feel proud when I’m given a medal at the end of a race. It’s fun! Geez.. not everything has to have reason and logic. Lastly – you sound so upbeat and happy in this post! I’m so happy for you! So happy to hear you so that about your happiness!! !